TransylvanianDutch: Ancestry says I'm Related. Am I? Ancestry says I'm Related. Am I? 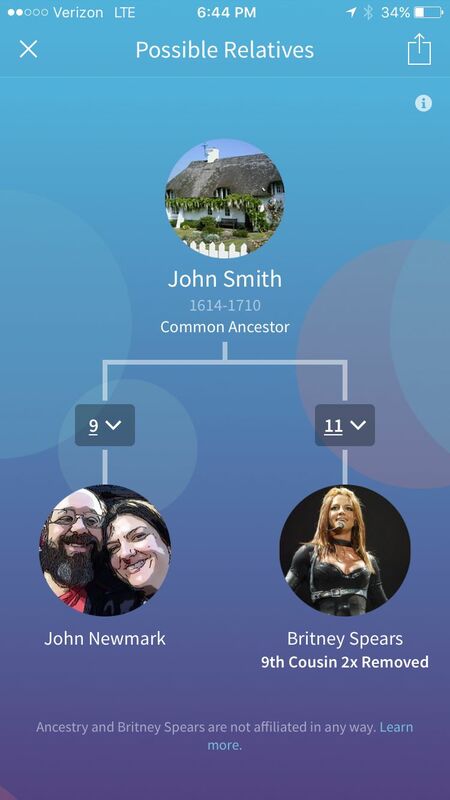 Randy Seaver at Genea-Musings and DearMyrtle have both discussed Ancestry.com's new mobile app - We're Related. Find the fame in the fam. Are you related to someone famous or one of your closest friends? 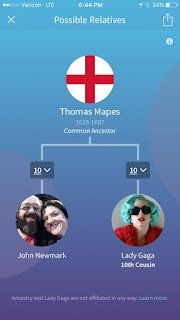 We’re Related can show you the surprising, significant, or boast-worthy connections in your tree. Your coworker could be your cousin. Or your cousin could be an icon. As Randy suggested, it certainly sounds at first like they've resurrected their old One World Tree, which I wrote much about in past years. 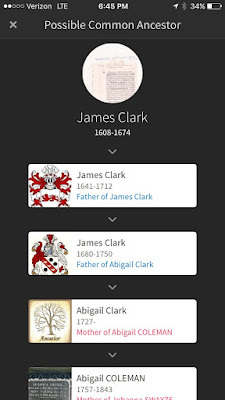 One World Tree did claim that Chaucer was my 18th Great Grandfather, but unfortunately I was able to disprove the relationship. Of course I downloaded the app to see who they found. 1) You don't sign in with your Ancestry account. You don't need one. You sign in with your Facebook account. 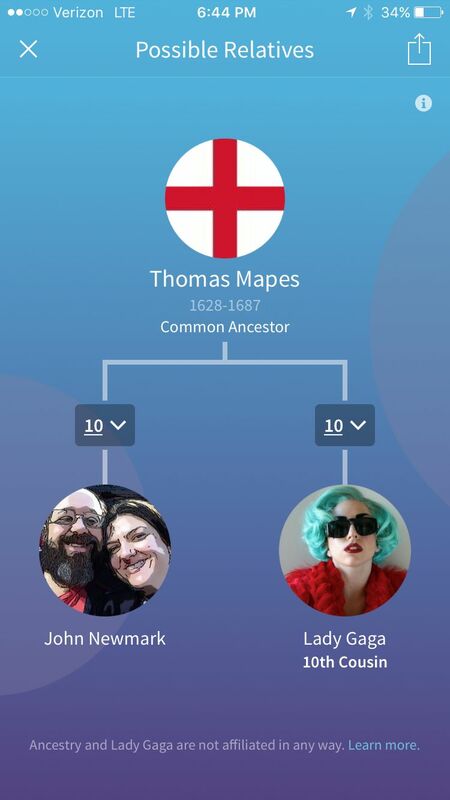 If you don't have an Ancestry account, by checking who you've indicated on Facebook relationships as parents, siblings, cousins, etc, it probably tries to find you in their public trees. I'm unsure how successful they are, because naturally, they quickly figured out my Ancestry account userid, and I checked that they were correct. 2) I then selected one of my trees to use to find famous relatives, and once I did that, it stated that it was searching all of their Public Trees. I think their old One World Tree was at least partially based on their Public Tree database, but I also think there were other trees involved. First: They didn't find Chaucer. Nor did they find any descendants of my ancestor, Thomas Stoughton. 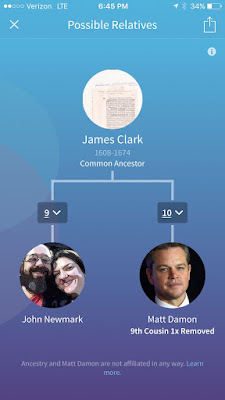 Stoughton is in my public tree, so I am somewhat surprised that none of my famous Stoughton cousins are yet in their database. (e.g. FDR, Grant, Romney, Palin, Kerry) Maybe these relatives will turn up later. 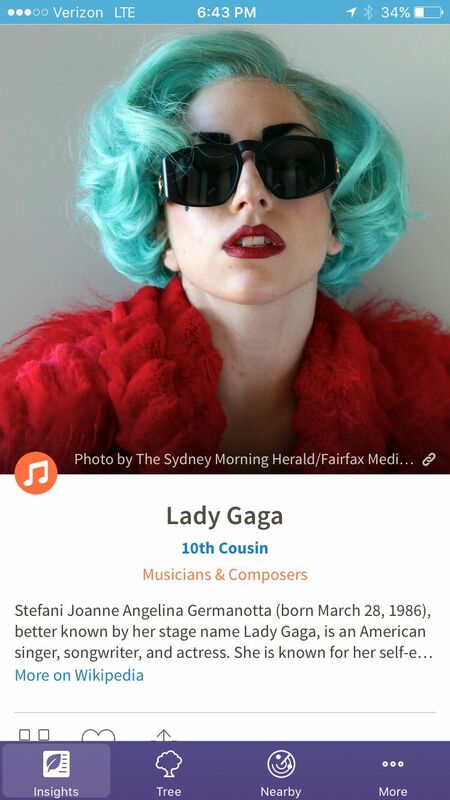 Lady Gaga is my 10th Cousin? Cool! 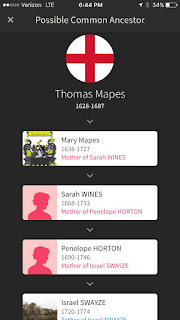 It says our shared ancestor is a Thomas Mapes, born in 1628. 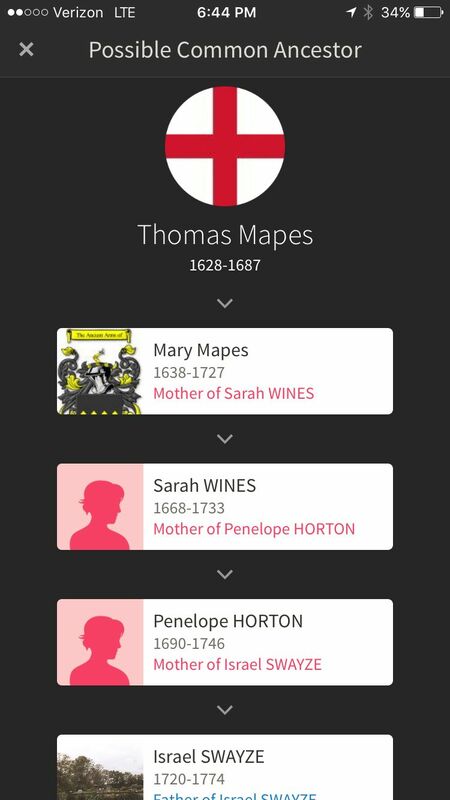 Apparently, his daughter, Mary Mapes, my ancestor, was born in 1638. Hmm. This is reminiscent of One World Tree. Maybe both of these years of birth are estimates, and Thomas really is the father of Mary. Or, maybe not. How common is/was the Mapes surname? Perhaps, with a little bit of research, I might discover she isn't my 10th cousin, but 11th, or 12th. Britney Spears and Justin Bieber?! This doesn't really excite me, but perhaps it will excite some in my family. It also appears Britney and Justin are cousins. 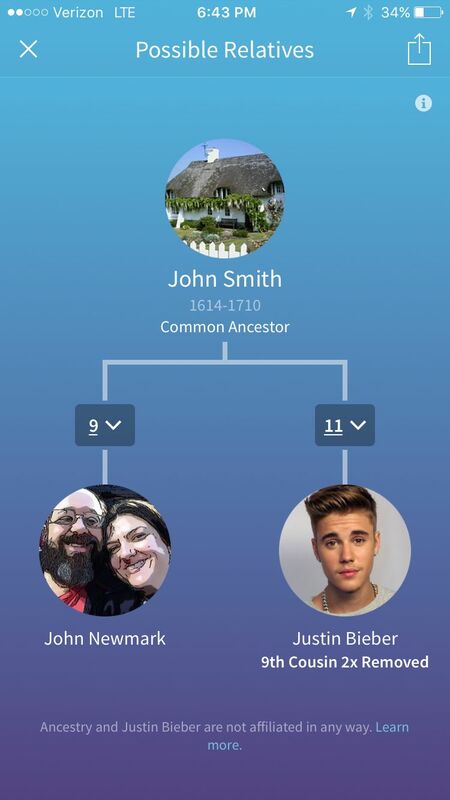 Am I really a descendant? I don't have parents for Mary Pitney in my database. Is Susannah, Samuel and John Smith accurate? Perhaps. Definitely worth researching. Smith is a much more common surname than Mapes. For Matt Damon to be confirmed as my 9th cousin 1x removed, I'd need to confirm Abigail Clark's father, grandfather, and great-grandfather. Not Bad. 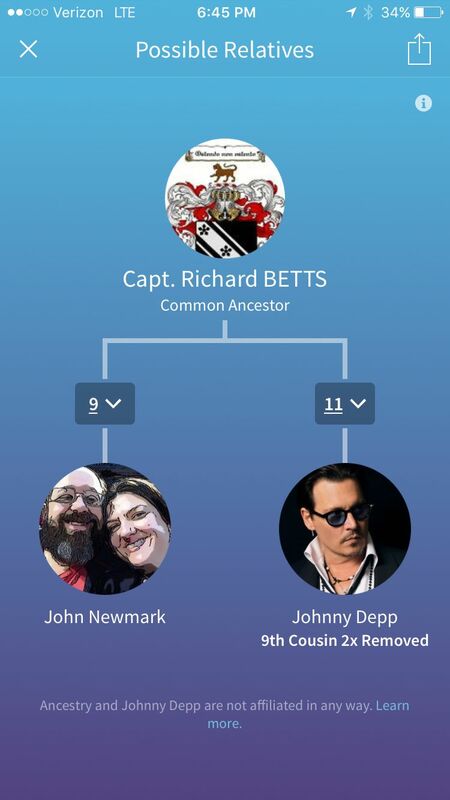 And our shared ancestor is a Captain (though likely not a pirate.) Of course, I don't know if Depp's ancestry is correct. Perhaps the best part of the app (like One World Tree) is that it provides suggestions for research. Another feature of the app, which does sound intriguing, is you can get together with friends who have the app, press a button, and see if anyone within 500 feet is related to you. That could be great fun at genealogy conferences, or at genealogical society meetings. 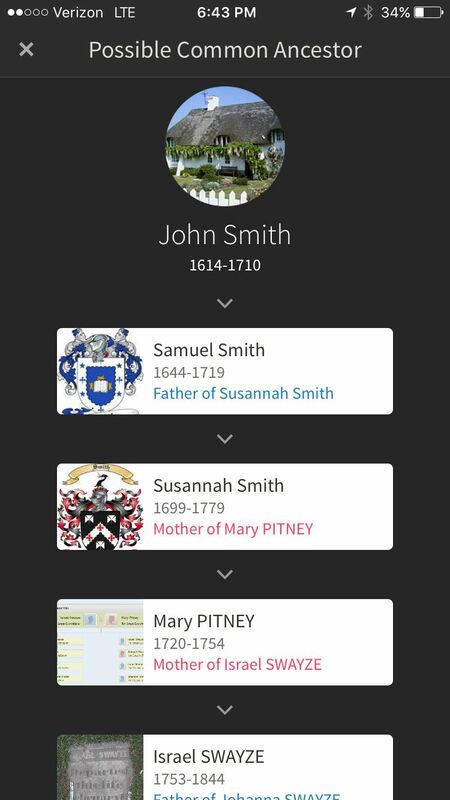 Update 10/20: Just realized that if I can confirm that Mary Pitney is the daughter of Susanna Smith, according to William Addams Reitwiesner (whose research I trust), I am descended from John Smith of Barnstable, and furthermore, I'm cousins with President Obama.